Let’s make sure you are ready when your attention turns to your wood floors. There are several items you might want to check so that you aren’t regretting it later in the year. Floor protectors: Inspect any chairs or small items to make sure the floor protectors are still in good shape. We have chairs around the counter that get used a lot. I flip them over and usually replace the protectors. Over the year they become compressed and don’t have any flex or cushion. If they are compacted, they usually are now a harder surface and need to be replaced. Floor cleaner: Do you have enough cleaner in stock to get you through the demanding summer months or holidays? Most suppliers sell cleaner by the gallon. Cleaning pads: How about the microfiber pads used to clean the floors? I usually use two wet when I am cleaning and a dry one to tack the surface down. Double check to make sure your inventory is up to date. Have you changed maids or cleaning companies within the year? Many cleaning crews have their own ideas about how to clean wood floors and quite often, they are dead wrong. I have information at my website if you need a review. Don’t forget to look under area rugs. You might be surprised at what you find. Many people pull back the rugs and see a pad that is disintegrating or adhering to the floor and needs to be replaced. There are some very good options out there that are good for the floor and the rug. Finally, let’s take a quick scan of the high traffic and high use areas. Look for any areas where the floors look like they may be getting darker. Check the kitchen, all exterior entrances, outside bathrooms and family rooms. If the floors are getting darker, act immediately! This usually indicates moisture is getting down in the wood and damaging it, not the finish. The longer you wait, the worse it will get and the fewer the options you will have available. This is critical, so make sure it is on your list. 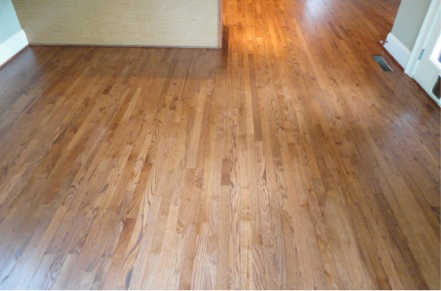 Cleaning, maintaining and protecting wood floors is easier than it has ever been. It’s a combination of common sense, good products, and a willingness to keep your eyes open and put in a little elbow grease.